From Megan OLeary of Highland, Maryland on 9/15/2017 . Absolutely love this top. It's very soft and comfortable - and love the design! The description says "relaxed fit," but I would order your regular size, in case you're thinking of sizing down. 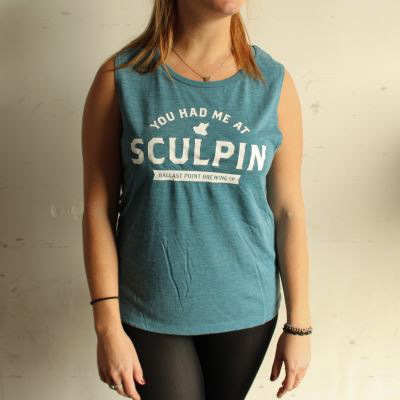 Super soft, a must have for the sculpin loving lady in your life. From Anonymous of Buffalo, New York on 8/21/2017 . This tank is so soft, like unbelievably soft. We bought this as a gift when visiting the San Diego brewery. Our friend who watched our dog while we were away absolutely adores it.